Thiocarbamate pesticides, which are widely used in agriculture, have attracted considerable attention because of their impact on people’s health and adverse effect on environmental safety. 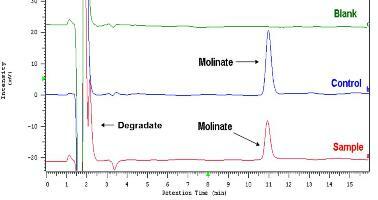 In this study, the removal efficiency of molinate by various oxidants and identification of the degradate of molinate in water at different oxidation treatment conditions were investigated using LC-MS/MS. The oxidants tested were, free chlorine (FC), monochloroamine (MCA), UV radiation (UV), chlorine dioxide (ClO2), permanganate (MnO4-), ozone (O3), and hydrogen peroxide (H2O2). Hexahydro-1-H-azepane-1-carboxylic acid was detected as being a major degradate of molinate after its treatment with free chlorine and ozone, while no degradates were present after treatment by other oxidants. Kinetic results for a typical free chlorine degradation indicated that the reaction of molinate with free chlorine was extremely fast. Hexahydro-1-H-azepane-1-carboxylic acid, the molinate degradate, showed more resistant to free chlorine in the same treatment. A possible degradation pathway of molinate is proposed.